Local shares hobbled into the third quarter yesterday with little to excite traders locally although impending United States jobs data and trade war fears kept minds focused. 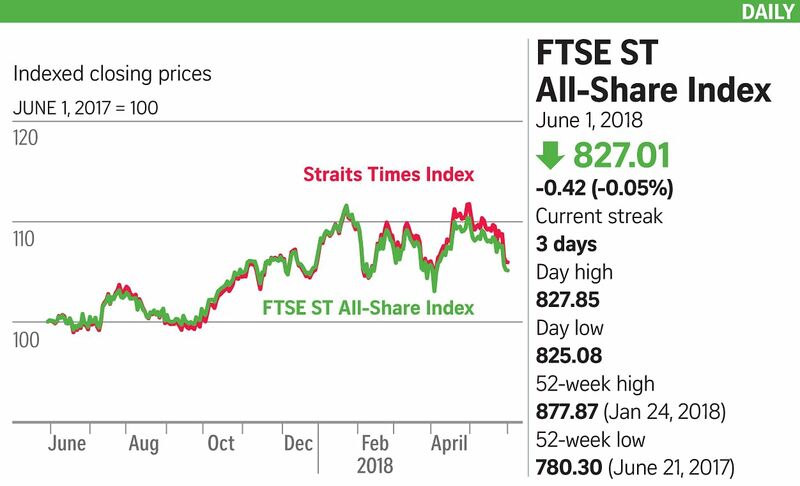 The Straits Times Index failed to stay above water, dipping 0.7 points or 0.02 per cent to 3,427.5 with banks leading the decline. It was a harsh week for the STI, which lost 85.72 points or 2.4 per cent. About 2.2 billion shares worth $1.38 billion changed hands with losers outpacing gainers 212 to 195. Maybank Kim Eng Research said the STI's growth of about 1.2 per cent this year is "quite mediocre", following a strong second half last year. It pointed to jitters in the region, concerns over a tech sector de-rating and trade war risks. Hutchison Port Holdings Trust (HPHT) extended its losses, slipping 0.5 US cent or 1.8 per cent to 27 US cents. It lost 7 per cent on Thursday on the back of MSCI's rebalancing. This involved moving the units from the MSCI Singapore Index to the MSCI Singapore Small Cap Index yesterday. OCBC Investment Research expects medium-term volatility in the counter as HPHT is seen as a proxy to the US-China trade situation. Sabah-based timber firm Jawala International joined the Catalist yesterday, opening at 26.5 cents versus its offer price of 25 cents before closing at 26 cents. Asian markets were mixed with benchmark indices in Japan and China in the red while South Korea, Hong Kong and Malaysia ended the week with gains. Bourses in Europe and the US slipped overnight as President Donald Trump fanned trade war fears after he said the US would impose steel and aluminium tariffs on the European Union, Mexico and Canada. At least the Italian political crisis appeared to be resolved. Analysts say the US move may be to gain negotiating leverage ahead of the next round of talks with its trading partners. "The US strategy throughout this administration has been to make headline-grabbing moves in the lead up to negotiations, and then settle on more modest moves after negotiations," said JP Morgan Asset Management global market strategist Hannah Anderson. "In the grand scheme of things, there are bigger market-moving narratives investors should pay attention to, including continued developments in Italy, rising inflation expectations in the US and the implications for the Fed, and the continued divergence in emerging markets assets (amid rising rates)."